Well, we've had the first bit of trouble in our soon to be paradise at the Squash House! I received an email and a call from our contractor - who happens to live across the street - that his wife woke him at 3:00 a.m. to the sounds of a woman screaming and breaking glass! Ted ran outside to find nothing. He walked up and down the street and all he found was a car window of another neighbors that had been broken. Some time ago, in an effort to make it look like someone lives at the Squash House, we told Ted to feel free to park his contractor's trailer in the driveway and use the garage as much as he likes. Ted said he had been over there for several days in and out of the garage, but it wasn't until yesterday when our cabinet fellow was over that mentioned the broken window to Ted who really hadn't noticed it! I can see why he might have missed it - this bedroom window is on the other side from the garage and our large Dogwoods could have easily masked it from view - which is probably a good thing! So now I'll have to make another solo trip over tomorrow for a few days to take care of getting the window fixed. Just for good measure I will also install some timers on lamps throughout the house. Mr. Squash had a procedure done on his ruptured disk yesterday and is feeling much better! He has to take it easy for the next week, but if all goes well, he should be feeling close to normal soon! He wanted me to thank all of you who have sent such kind well wishes his way! I'm sorry to say I won't be posting to Vintage Thingies Thursday this week as I just won't have time to keep up with emails and blogs. But be sure to visit Suzanne tomorrow for a list of fun vintage posts! I'll be back next week for sure! The cabinet maker told me all the doors and hardware are now installed and look fantastic - can't wait to show you those pictures! Have a safe drive, and I hope Mr. S. feels better soon. Oh, those things are so frustrating! Have a safe trip...and hopefully this is the first and last visit from the hooligans! Oh man, that stinks. I was thinking light timers would be a good idea and then you mentioned it. Sorry Mr. S. has to go through some treatment but hopefully he will be feeling his old self again. Argh! Well, I'm glad to hear Mr. Squash is on the road to recovery and listen, you drive save on the way to the Squash House. I like the idea of timers and all that! Best wishes to Mr. Squash House. I didn't realize he was having a procedure. Well the hooligans are probably kids thinking it's fun to destroy people's property! How about some motion sensor lights on the outside that come on when someone gets in range? I must have missed the post about Mr Squash, glad that he's on the road to recovery. So sorry to hear about the window, hopefully once you've moved in that sort of thing won't be a problem. Oh gosh, what a pain, be safe and I am so glad Mr.S. is feeling better! These hooligans have nothing better to do!...here they are breaking into cars at night if left out in driveway..
All the best to Mr Squash.. Safe travels, Candace. Why do people have to do things like that? Happy to hear that Mr. Squash is feeling better. What a pain! Travel safely. I bet you could just live over there already. Drive safely...and enjoy another visit in your paradise! Although not for a fun reason! I'm so glad that everything is ok with the Squash House. The timers and someone parking in the driveway should be really helpful. Tell Mr. Squash that I hope he's back to fishing real soon! So...what's up with the screamin lady? Too bad some people have nothing better to do than destroy other people's property. Speedy recovery to Mr. Squash and here's to a better week ahead. How nice that you have people there that are looking out after things for you there Candace. I'm praying Mr Squash is all better quickly and hoping you are pleasantly surprised with blessings on your solo trip to the squash house!! How stupid some people are! I hope the window is the only harm done. Have a safe journey. Best wishes to Mr. Squash! So glad to hear Mr. Squash is feeling better now and hope he will continue to mend. What a shame about the window. Darn those hooligans. Tell Mr. Squash to take it easy and get better soon. 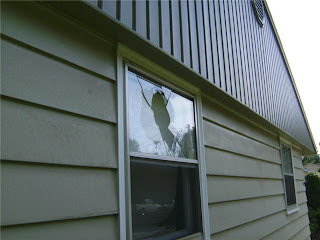 I hope nothing in the house was damaged by the window breaking. And hopefully this is the only window. Isn't that just the way things go though. Sheesh. Just what you didn't want to do! Keeping cars in the drive should be a good deterrence, we've got a couple of houses on our street that are vacant, but others are keeping cars parked in the empty drive ways to heed off would be riffraff! Have a safe journey. Take care, our blessing are with you. Candace, so sorry for your troubles. Can't understand why people do these things. How aggravating! I hope that doesn't happen again! I am glad to hear Mr. Squash is feeling better and I hope he has a swift recovery. Ouch...a ruptured disk, surgery and vandals, too. I am wishing your hubby a perfect recovery and for your house to sell soon you can move to your new home. Hia Candace, back now. I'm so sorry to hear about the idiotic behaviour. The timed lamps are a good idea. Good to hear Mr Squash is doing better now his back has been seen to. I hope he makes a quick recovery. Safe journeys my friend and as a previous police dispatcher, you are doing the right thing...timers, friends using the garage, etc. I pray for Mr. Squash to feel better, after my spinal fusion in June, I am still not feeling perky! Hope all is well and there's nothing damaged inside. Don't forget to retime those timers everytime you go up there so it won't be so predictable and will accomodate the changing of the seasons. Good health wishes for Mr. Squash! Hope you're back home and that all went well at Squash House! Hope Mr. Squash is up and fishing! Sorry about the broken window, such a pain! And glad your hubby is doing better.